What Does a Bank Teller Do? Bank tellers are typically the first point of interaction for customers as they enter the bank. Tellers verify the identity of customers and process requests for deposits to and withdrawals from patron accounts. They generate certified checks and money orders according to the specifications of customers. Some tellers exchange dollars for other currencies. Bank tellers answer questions about bank products and services and direct customers to other staff for more complex bank transactions. They must count cash in their drawers as they begin their shift and reconcile remaining cash at the end of their shift to account accurately for deposits and dispersals. Most tellers work in the branches of community and commercial banks. Some tellers work for credit unions. Bank tellers must safely and accurately handle customer funds by verifying identity and taking other actions to prevent errors or fraud. Head bank tellers manage operations of bank tellers. A bank teller's salary varies based on the geographical location, level of experience, type of employer, and other factors. The minimum education requirement for tellers is a high school degree, but tellers with an associate or bachelor's degree can advance more readily to assistant manager, personal banking, loan officer, and bank manager jobs. Relevant coursework: Coursework in business, finance, accounting, and economics is helpful for prospective bank tellers who take college courses. Most training for tellers is done on the job by managers and more experienced tellers. Customer service skills: Workers interested in becoming bank tellers should develop and showcase customer service and mathematics skills as well as an orientation towards detail and accuracy. Basic accounting: Bank tellers handle money and therefore must be able to keep track of numbers. Although most transactions are guided and tracked by computers, tellers still need to know what the figures should be so that they can recognize and respond to a problem if one occurs. Attention to detail: Attention to detail is a big part of a bank teller’s job, from handling money properly to keeping accurate records of transactions to following proper security protocols. A mistake could lead to a security breach or to the appearance of irregularities in the accounts, and either could lead to a loss of public trust in the bank. Knowledge of financial software: Bank tellers must be able to use specialized financial software. Training may be available on the job, but understanding the software beforehand, is an advantage. Written and verbal communication: Tellers handle money, but they also handle people. Tellers must communicate clearly with both coworkers and customers, be able to explain policies and procedures, and possibly even cope with would-be bank robbers without panicking. Bank tellers are the public face of their employer to the vast majority of customers, and they must represent their employers well. According to the U.S. Bureau of Labor Statistics, the outlook for bank tellers over the next decade relative to other occupations is much lower than the average for all occupations, driven by increased online banking activity, which has reduced the need for bank branches and bank tellers. Employment is expected to decline by about 8% over the next 10 years, which is much lower the average growth projected for all occupations between 2016 and 2026. Growth for other financial clerk jobs is projected to be 0% over the next ten years. These growth rates compare to the projected 7% growth for all occupations. 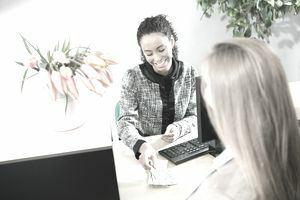 Despite the decline in available jobs, individuals may still find work as a bank teller due to banks' need to replace workers who choose to leave their occupation. The position can also lead to higher-responsibility jobs such as loan officer. The majority of bank tellers work in bank branches for commercial banks, serving the general public. Most bank tellers work a 40-hour week, with only about three out of 11 working part-time in 2016, according to the U.S. Bureau of Labor and Statistics. Visit local banks during times when they aren't busy and ask to speak to the manager. Start with a bank where you or your family has an account. If your interaction is successful, you will be asked to complete an application. Follow through with the application process right away. Often this will involve completing an online application. Reach out to neighbors and friends and ask if they know anyone working at a local bank and if so ask your contact for an introduction. Search Google using the name of the town where you want to work and "bank" or "banks," for example, like "Huntington, NY banks." Check the bank's website to see if you can apply online for a teller position. Check job listings. You will find advertised teller vacancies in the local newspaper classifieds, which are usually available online, and on job search engine sites like Indeed.com. Banks are image conscious so dress the part in professional business attire. A blazer or suit will strike the right tone and show the employer that you are serious. Greet managers with a firm handshake and a warm smile. Be ready to share your strong interest in banking. Detail some of your strengths which meet the job requirements. Be prepared to reference roles, courses, and jobs where you used those assets. For example, you might say, "I have always liked math and received good grades in the subject. I was treasurer for the entertainment club and accurately maintained the financial records of the club." Practice your presentation with a friend or family member. Review these tips for how to ace an interview.